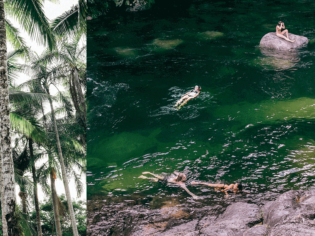 The sights around Port range from reef to rainforest, where natural waterholes keep things cool (photo: Elise Hassey). A town with a roller-coaster history of big booms and tragic falls, Port Douglas is back on track, with big investments returning this small tropical spot to the limelight. “Have you taken a Kwells?” asks my obviously concerned driver, as we snake around the first tight bend of the Captain Cook Highway, the only path to Port Douglas from Cairns. My white-knuckle grip on the door handle must have given my green gut away. “This road gets pretty windy,” she adds, and she’s not kidding. The one-hour journey from Cairns airport to Port Douglas is an aggressively curly yet breathtakingly scenic route, rotating between quick visions of breezy sugarcane plantations, the distant Daintree rainforest, some crocodile spotting, and, of course, the sparkling turquoise coastline of the Coral Sea, leading out to the Great Barrier Reef. With a front-seat view of such picturesque distractions, my queasiness has no chance. Quicksilver Cruises have their own spacious platform on Agincourt Reef (photo: Elise Hassey). Port Douglas, or Port as the locals call it, is a town with a history full of its own twists and turns. The gold rushes of the late 1800s saw it overtake Cairns as the main mining port, growing the population by thousands. But tragedy struck in 1911, when a cyclone flattened most of the town’s buildings, many never to be rebuilt. When the initial build of the Captain Cook Highway between Cairns and Mossman bypassed Port Douglas, Mossman was set up as the centre of the Douglas Shire, and by 1960, just 100 Port Douglas locals remained. I’m a newcomer to Port, with expectations based only on mixed reviews from friends who wax lyrical about best-ever childhood family holidays to more recent travellers unimpressed with the still daggy and dated facilities from the 1980s. 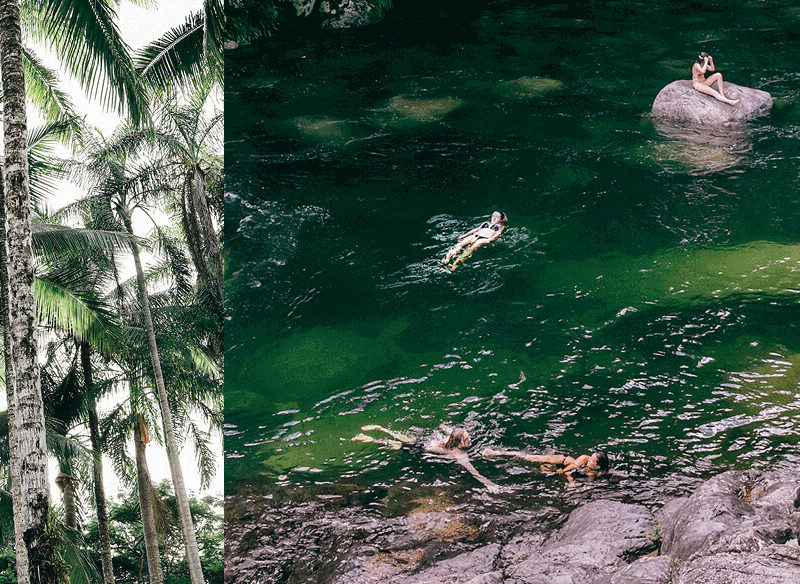 What I see today, as we drive through the small tropical town and pull up to the lobby of the newly renovated Sheraton Grand Mirage Resort, is Port Douglas on the upswing. The open deck at barbados at the marina (photo: Elise Hassey). After the illustrious launch of the $100 million Sheraton Mirage by Christopher Skase back in 1987, the town was opened up to the world and Port Douglas saw its biggest boom period over the next two decades. “The resort became a playground for the rich and famous,” says Steve Molnar, general manager of the resort; celebrity visitors included Bill and Hillary Clinton, Tom Hanks, John Travolta and Mick Jagger. But as almost 30 years passed and ’80s style turned from cool to cringeworthy, the resort lost a little of its lustre, as did much of the town’s surrounds. “When you’re sending a message that Port Douglas is a high-end world trip, the property can’t be dated. Everyone is looking for that next new thing,” says Steve. With the intention of bringing the five-star hotel’s reputation back from its glory days, owners Fullshare invested $43 million into a complete refurbishment, keeping the bones of the building intact, but with everything else reimagined for the 2017 visitor. Walking past the two hectares of refreshed saltwater swimming lagoons, I come to the Sheraton’s private entrance to Four Mile Beach, a sandy stretch of clear blue sea and waving palms. It’s a sign of the town’s intrinsic connection to the water – one it has built its very foundations on. Stretching out for more than 2000 kilometres, the Great Barrier Reef is the world’s largest coral reef, and Port Douglas is one of the closest gateways to the UNESCO World Heritage Site. Launching the very first tour to the Low Isles back in 1979, Quicksilver Cruises is a pioneer in exploring the area. Aboard its high-speed catamaran (seasickness tablets in hand, of course), I settle in for the one-hour journey to Agincourt Reef. This small group of pristine ribbon reefs runs parallel to the Continental Shelf, and Quicksilver have anchored a two-level floating platform just above it. It’s a little daunting for those without their sea legs – there’s nothing but 360 degrees of deep blue surrounding us, and a whole other ecosystem thriving just below. “One of the things I love the most about the tour is you’ll see even the long-term crew come out of the water, with big grins on their faces, and say ‘Did you see that? How amazing!’. To have that as your office every day, it’s pretty great,” says Megan Bell, who has been in the Quicksilver company for 18 years. I’ve never been this far north in Australia, and it’s my first chance to catch a glimpse of this underwater universe. I jump off the snorkelling platform into the water and see firsthand that Quicksilver’s office is, indeed, amazing. While it’s not quite as colourful as I imagined, the dramatic silence of being underwater, deep drops opening up to never-ending chains of coral, schools of gliding fish and even a turtle swimming by to say hello, is living proof that Port Douglas will never really go out of style. Back on dry land, I have a lunch date booked at the newly renovated Reef Marina. Walking across the palm-fringed harbour, past the remains of the deserted shopping complex, I wonder if I’m in the right place. Weathered timber boards and chipped yellow paint are evidence of the marina’s decaying heyday; most of the buildings have been left untouched over the past 30 years. But closer to the water, along the recently updated boardwalk, you can see why this spot is now the talk of the town. Opened at the marina in 2016, Hemingway’s is Port Douglas’s first craft brewery. Putting the pure waters of nearby Mossman Gorge to good use, the brewery makes a range of high-quality beers that nod to important moments in the town’s timeline. “We wanted the locals to feel like it was their pub, their place and their beer; all of our six beers have been named after someone who was local here,” says Hemingway’s general manager, Dean Scadding. The Prospector is a bright and refreshing pilsner brewed in honour of the gold rush; Doug’s Courage, a pine-scented IPA, commemorates the community’s incredible spirit after the tragic cyclone; and Pitchfork Betty’s is a pale ale named after the town’s most famous publican. “Betty Whiting used to have one of the first pubs here in Port Douglas. She became a bit senile and, if anybody started to upset her, she’d start chasing them out of the pub with a pitchfork – she was a bit of a legend in town,” says Dean. It’s places like this, along with modern restaurant and cocktail bar Barbados around the corner, that have brought life back to the marina. “We’re not a traditional sort of pub. People can actually sit down, taste and experience the different beers,” says Dean. “We offer somewhere else for people to go, not just wander up and down Macrossan Street. There’s definitely something in the water here. From the marina, the launching point to the incredible Great Barrier Reef, you’ll see the iconic St Mary’s by the Sea chapel, torn apart by the cyclone, then uplifted and relocated to the harbour. The Coral Sea coastline frames the town, and the constant waterfront views and seaside lifestyle are hard to beat. It’s the final morning of my trip, and I have just enough time for a coffee stop before my flight back home. Sparrow Coffee, a bright blue takeaway coffee shop on the town’s main drag, Macrossan Street, is attached to a colourful beach-themed homewares store Ahoy Trader, which is just the spot for seaside souvenirs. With original locations in Bangalow and Byron Bay, Sparrow was opened in Port Douglas in June 2015 by husband-and-wife team Tristan and Kassia Grier, and co-owner Brooke Hudson. For Tristan and Kassia, it was only a matter of time before they returned to Port Douglas, after falling under the town’s spell 10 years ago. “Port Douglas for us has always been a bit personal – it was the first place my wife and I went when we first fell in love. When we left Port, we were so in love with the place, we wanted to come back once a year, at least,” says Tristan. a place that people want to come back to. “When you get off the plane in Cairns, the Daintree is right there and it’s just pumping energy into the world… then you take the drive from Cairns to Port Douglas and there’s just nothing like it,” he says. – Port Douglas is a one-hour drive from Cairns International Airport. – After a stunning revitalisation last year, the Sheraton Grand Mirage Resort has returned to five-star luxury status. Pick a Lagoon Edge room to dip straight from your balcony into one of the two hectares of saltwater swimming pools. – Head to Hemingway’s Brewery at the Reef Marina for a waterfront lunch of stone-fired pizzas and exceptional pub food. Its beef comes from cows that are fed leftover brewing grain. – Spend cocktail hour at Barbados, an open waterfront bar and restaurant in the marina that offers expertly mixed drinks and a modern menu of fresh seafood, antipasto platters and creative salads. – Visit the colourful Great Barrier Reef with the Quicksilver Group. Experiences include a trip to its own pontoon at Agincourt Reef. Snorkel or dive from the submerged platform, stay dry on a semi-submersible boat, or take a helicopter ride for a bird’s-eye view.